Given the likely associations among depression, anxiety, fatigue, poor sleep quality and increased migraine-related burden and risk of migraine disease progression, it is critical to understand the impact of migraine treatment on the manifestation and management of these comorbidities. Potential treatments for CM that also reduce psychiatric comorbidities, improve sleep quality and reduce associated fatigue symptoms would be valuable. This analysis of the COMPEL study evaluates the effects of onabotulinumtoxinA CM treatment on clinically significant symptoms of depression and anxiety, as well as associated poor sleep quality and symptoms of fatigue. Additional exploratory analyses were conducted among those with depression or anxiety at baseline. These assessments compared clinically meaningful reductions in comorbid symptoms among those who responded to onabotulinumtoxinA treatment with clinically meaningful reductions in headache days with those who did not. The COMPEL study was an international, multicentre, open-label, prospective study evaluating the long-term safety and efficacy of onabotulinumtoxinA 155 U (fixed-dose, fixed-site treatment paradigm) every 12 weeks for nine treatment cycles (108 weeks). Study methodology has been described previously23 and is summarised briefly here for context. Adults with CM and stable comorbidities were included in the study.23 Patients could be receiving oral preventive treatment for migraine (stable dose for >4 weeks prior to study and to remain unchanged up to week 24), but were excluded if they had previously been administered onabotulinumtoxinA, had severe major depressive disorder (Beck Depression Inventory-II score >24), reported suicidal ideation, as determined by endorsement of a non-zero response to item 9 (‘Thoughts that you would be better off dead, or hurting yourself in some way’) on the Patient Health Questionnaire (PHQ-9), or were pregnant or planning a pregnancy.23 There were no specific exclusion criteria relating to the degree of anxiety. The primary efficacy measure in the COMPEL study was change from baseline in headache days per 28-day period (headache frequency) at 108 weeks as assessed by patients’ daily diaries.23 Exploratory outcome measures included change in PHQ-9, Generalised Anxiety Disorder (GAD-7), Pittsburgh Sleep Quality Index (PSQI) and Fatigue Severity Scale (FSS) scores from baseline. Safety and tolerability were assessed at each visit for patients who received ≥1 onabotulinumtoxinA treatment.23 Patients were withdrawn from the study and referred for appropriate follow-up care if they became pregnant or reported or showed signs of suicidal ideation. Similarly, the total GAD-7 score, consisting of seven anxiety criteria from the DSM-IV, was used to provide a measure of anxiety severity.26 Respondents rated how frequently they experienced seven anxiety symptoms over the preceding 2 weeks on a 4-point (0–3) scale. The total GAD-7 scores range from 0 to 21 (none to most severe), distributed as 0–4 (minimal symptoms of anxiety), 5–9 (mild), 10–14 (moderate) and 15–21 (severe). Using the validated scoring system, a GAD-7 score ≥10 indicates generalised anxiety disorder. Fatigue was assessed using the FSS, a validated measure assessing fatigue severity and its impact on daily living, scored on a 7-point (1–7) scale ranging from disagree (1) to agree (7).29 30 A higher score indicates more severe fatigue, with scores ≥36 considered significant fatigue (range 9–63). Changes in symptoms of depression and anxiety in patients with CM with clinically significant depressive or anxiety symptoms at baseline were assessed after onabotulinumtoxinA treatment and were based on a null hypothesis of no improvement. The PHQ-9 was completed at screening for exclusion of suicidal ideation per the protocol, and the PHQ-9 and GAD-7 were completed at baseline and at weeks 12, 24, 48, 72 and 108. Changes in the PHQ-9 and GAD-7 scores from baseline were assessed in the total population and in those with clinically significant baseline depressive or anxiety symptoms. Consistent with other studies in which a decrease of ≥5 points for individuals with pretreatment PHQ-9 scores ≥8 was considered clinically relevant,31 32 a ≥1 severity category improvement in the PHQ-9 or GAD-7 score from baseline (eg, from moderate [PHQ-9 or GAD-7 score of 10–14] to mild [PHQ-9 or GAD-7 score of 5–9]) was considered clinically meaningful improvement. Analyses were also undertaken to determine onabotulinumtoxinA effects on sleep quality and fatigue symptom in the analysis population and for sleep quality in those with poor sleep quality (PSQI >5) at baseline. The PSQI and FSS were completed at baseline and at weeks 24, 60, 84 and 108. A ≥3-point decrease in the total PSQI score was considered to be a clinically meaningful improvement28; however, this definition has not been validated in clinical trials. No clinically meaningful improvement was defined for FSS scores as there was no validated or published definition available in the literature; however, patients with a ≥20% or ≥30% decrease in FSS score from baseline were assessed. The main analyses for the changes in comorbid symptoms were based on observed data; per-protocol sensitivity analyses were undertaken using last observation carried forward for missing data. Tests of statistical significance were only carried out for the main analysis population and the subgroup analyses comparing outcomes in headache day reduction responders versus non-responders. A total of 716 patients were enrolled in the study (safety population) and 715 patients received ≥1 dose of onabotulinumtoxinA; of these, 373 patients (52.1%) completed the study.23 The most common reasons for study discontinuation were withdrawal of consent (n=92, 12.8%) and loss to follow-up (n=82, 11.5%), with 4.9% (35/716) of patients discontinuing because of lack of efficacy and 3.5% (25/716) because of adverse events; 4.1% (29/716) discontinued the study after the final treatment and before the final follow-up visit. The enrolled population had a mean (SD) age of 43.0 (11.3) years and were primarily female (n=607, 84.8%) and Caucasian (n=582, 81.3%). Mild or worse depressive symptoms (PHQ-9 ≥5) were present in 529 patients (74.5% of those with PHQ-9 scores at baseline) and clinically significant anxiety (GAD-7 ≥10) in 175 patients (24.6% of those with GAD-7 scores). At baseline, the mean (SD) PHQ-9 score was 11.4 (4.6), indicating moderate depressive symptoms, and the mean (SD) GAD-7 score was 14.0 (3.3), indicating moderate anxiety symptoms. In the analysis population, statistically significant mean (SD) reductions in headache days from a baseline of 22.0 (4.8) days were observed from the first assessment (–7.4 [6.2] days at week 24) and were sustained and further improved throughout the 108-week period (–10.7 [6.4] days). Based on observed data only, onabotulinumtoxinA treatment was also associated with significantly decreased (improved) mean sum PHQ-9 and GAD-7 scores; change from baseline was significant at all time points for both assessments (figure 1A,B). Similarly, in per-protocol analyses using last observation carried forward for missing data points, the reduction in PHQ-9 and GAD-7 scores was significant at all time points (online supplementary figure 1). The percentage of patients who experienced ≥1 severity category improvement on PHQ-9 or GAD-7 (ie, clinically meaningful improvement) increased over the study. By week 108, 53.4% (198/371) of the analysis population had a clinically meaningful improvement in symptoms of depression and 37.3% (139/373) in symptoms of anxiety (online supplementary figure 2). Change in (A) PHQ-9 scores and (B) GAD-7 scores in the analysis population after treatment with onabotulinumtoxinA. *p<0.0001 compared with baseline. GAD-7, 7-Item Generalised Anxiety Disorder; PHQ-9, 9-Item Patient Health Questionnaire. In the 529 patients with mild or worse depressive symptoms at baseline (PHQ-9 ≥5), the mean (SD) PHQ-9 scores were reduced from baseline at week 12 by 4.5 (5.0), at week 48 by 4.7 (5.5) and at week 108 by 6.3 (5.5) (figure 2A). PHQ-9 scores decreased over the duration of the study, the magnitude of which was related to the degree of depressive symptoms at baseline (online supplementary figure 3). Of those with mild symptoms of depression, 69.6% had PHQ-9 scores <5 by week 108, as did 51.6% of those with moderate symptoms, 47.9% of those with moderately severe symptoms and 53.8% of those with severe symptoms. At week 12, 61.8% had a clinically meaningful improvement in depression symptoms, increasing to 66.8% at week 48 and 78.0% at week 108 (figure 2B). Among 175 patients with clinically significant baseline anxiety (GAD ≥10), the mean (SD) GAD-7 scores were reduced from baseline at week 12 by 6.0 (5.3), at week 48 by 6.3 (5.5) and at week 108 by 7.7 (5.8) (figure 3A). GAD-7 scores decreased over the duration of the study; the magnitude was related to the degree of symptoms of anxiety at baseline (online supplementary figure 4). At week 12, 69.3% had clinically meaningful improvements in anxiety symptoms, increasing to 78.0% at week 48 and 81.5% at week 108 (figure 3B). Of those with mild symptoms of anxiety, 65.8% had GAD-7 scores <5 by week 108, as did 43.7% of those with moderate symptoms and 40.6% of those with severe symptoms. Change in (A) PHQ-9 scores from baseline and (B) the percentage of patients experiencing a ≥1 reduction in PHQ-9 severity category after treatment with onabotulinumtoxinA in patients with mild or worse depressive symptoms at baseline (PHQ-9 >5). PHQ-9, 9-Item Patient Health Questionnaire. Change in (A) GAD-7 scores from baseline and (B) the percentage of patients experiencing a ≥1 reduction in GAD-7 severity category in patients with symptoms of anxiety at baseline after treatment with onabotulinumtoxinA. GAD-7, 7-Item Generalised Anxiety Disorder. In the analysis population, sleep quality was observed to improve with onabotulinumtoxinA treatment; the mean (SD) PSQI score significantly decreased from a baseline of 13.3 (3.7) to 11.0 (3.7) at week 108 (p<0.0001; table 1). A total of 40.9% had minimal clinically important responses (ie, ≥3-point decrease in PSQI28) at week 108. The results were similar in patients with poor sleep quality at baseline (data not shown). Similarly, symptoms of fatigue improved. The mean (SD) FSS scores significantly decreased from a baseline of 38.0 (14.5) to 30.1 (14.6) at week 108 (p<0.0001). At week 108, 43.8% of patients had a ≥20% decrease in FSS score, and 31.2% of patients had a ≥30% decrease in FSS score. 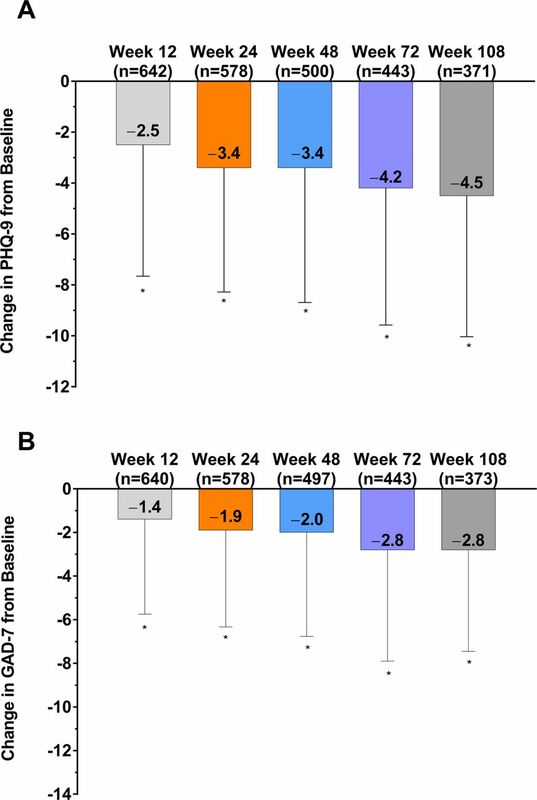 In patients with baseline depressive symptoms, a significant improvement (reduction) in mean PHQ-9 scores was observed at week 24 in patients with or without a ≥50% decrease in headache day frequency (≥50% headache day reduction responders or non-responders). The magnitude of change from baseline in PHQ-9 score was greater in ≥50% headache day reduction responders (−6.3) than in non-responders (–3.6). A significantly higher percentage of ≥50% headache day reduction responders had clinical improvements in depression symptoms at week 24 (83.7%) compared with non-responders (60.3%). The results were slightly less pronounced in those with a ≥25% reduction in headache days (≥25% headache day reduction responders). PHQ-9 scores changed by –5.8 in ≥25% headache day reduction responders vs –2.9 in non-responders (figure 4A); 79.8% of ≥25% headache day reduction responders had a clinical improvement in depression symptoms at week 24 vs 53.2% of non-responders (figure 4B). Mean change in (A) PHQ-9 and (B) the percentage of patients with a reduction of ≥1 severity category in PHQ-9 scores in those with depressive symptoms (PHQ-9 ≥5) at baseline, with or without a ≥25% decrease in headache days after treatment with onabotulinumtoxinA. *Significant change compared with baseline, p<0.0001. †Significant difference compared with non-responder group, p<0.001. PHQ-9, 9-Item Patient Health Questionnaire. In patients with clinically significant baseline anxiety (GAD ≥10), a significant improvement (reduction) in mean change in GAD-7 score was observed at week 24 in ≥50% headache day reduction responders and non-responders. The magnitude of GAD-7 score change from baseline was greater in ≥50% headache day reduction responders (–7.6) than in non-responders (–5.1); 86.0% of ≥50% headache day reduction responders had clinical improvements in anxiety symptoms at week 24 vs 71.4% of non-responders. The results were similar in ≥25% headache day reduction responders. GAD-7 scores changed by –7.2 in ≥25% headache day reduction responders vs –4.6 in non-responders (figure 5A). There was a non-significant difference in the percentage of ≥25% headache day reduction responders who had clinical improvement in anxiety symptoms (82.2%) compared with non-responders (70.4%; figure 5B). Mean change in (A) GAD-7 scores from baseline and (B) the percentage of patients with a reduction of ≥1 severity category in GAD-7 scores in those with clinically significant anxiety (GAD-7 ≥10) at baseline, with or without a ≥25% decrease in headache days after treatment with effect of onabotulinumtoxinA. *Significant change compared with baseline, p<0.0001. GAD-7, 7-Item Generalised Anxiety Disorder. OnabotulinumtoxinA was well tolerated (table 2), with treatment-emergent adverse events reported by 436 patients (60.9%) and treatment-related adverse events (TRAEs) by 131 patients (18.3%). TRAEs occurring in ≥2% of patients included neck pain, eyelid ptosis, musculoskeletal stiffness and injection site pain (table 2). Despite extensive screening throughout the study, there were few reports of suicidal ideation; four patients (0.6%) discontinued from the study due to suicidal ideation. The COMPEL study demonstrated that onabotulinumtoxinA 155 U administered over nine fixed-site, fixed-dose treatment cycles for CM was associated with clinically significant reductions in symptoms of depression and anxiety, suggesting additional possible beneficial effects beyond headache frequency reduction.23 These findings are also consistent with those from a small, open-label study in which onabotulinumtoxinA use was associated with decreased depression and anxiety symptoms in addition to reducing headache day frequency.34 In our analysis, beneficial onabotulinumtoxinA effects on depressive and anxiety symptoms occurred even with limited improvements in headache days. The changes in symptoms of depression and anxiety all reached statistical significance, even in patients with only mild symptoms of depression or anxiety at baseline. However, for outcomes to be meaningful for patient and healthcare professionals, an assessment against clinically relevant change must be demonstrated. In this analysis, reduction by ≥1 severity category was defined as clinically relevant. This definition is consistent with the recommended definition of clinically relevant change of improvement in PHQ-9 score ≥5 points for individuals with pretreatment PHQ-9 scores of ≥8.31 At week 24, 68.6% of those with mild or worse depressive symptoms and 79.8% of ≥25% headache day reduction responders had a clinically meaningful change in PHQ-9 scores. Importantly, and although less robust, onabotulinumtoxinA treatment was associated with clinically significant change in PHQ-9 scores in ≥50% and ≥25% headache day reduction non-responders, suggesting that the effect may be independent of the effect on headache day frequency. Similarly, the GAD-7 questionnaire has been validated as a screening tool in patients with migraine,35 assessing anxiety severity and monitoring change over time.26 In this analysis, reduction by ≥1 severity category was defined as clinically relevant, largely consistent with a definition of clinically relevant change of change in GAD-7 score from ≥10 to<10, or a reduction by ≥50% of the pretreatment GAD-7.32 At week 24, 75.6% of patients with clinically significant anxiety and 82.2% of ≥25% headache day reduction responders had a clinically meaningful change in GAD-7 scores. As with depression, onabotulinumtoxinA treatment was associated with a clinically relevant change in anxiety symptoms whether or not patients had a reduction in headache days. Regarding our exploratory analyses, findings demonstrated that depression and anxiety symptoms were reduced even in ≥25% headache day reduction non-responders. Thus, it seems possible that onabotulinumtoxinA could be having an independent effect on depression and anxiety symptoms, as has been observed by others for depressive symptoms.36 37 In addition to the effect on migraine, onabotulinumtoxinA could improve mood through social feedback mechanisms as a result of the individual’s improved appearance after relaxation of muscles in the glabellar region (the ‘facial feedback hypothesis’).36 In addition, through modulation of proprioceptive input, the peripheral effects of onabotulinumtoxinA may have a secondary central effect by dampening the peripheral sensory afferents travelling to the trigeminal nucleus, and thus modulating the central nuclei of the limbic system.38 39 Alternatively, and not possible to determine by these exploratory analyses, the effects could be an indirect consequence of onabotulinumtoxinA reducing headache day severity with or without reducing headache day frequency, leading to improvement in depression and anxiety symptoms, or they could be due to the healthcare professional providing standard pharmacological and/or non-pharmacological care for depression and anxiety throughout the study. Further, the majority of our sample was overusing headache medication at baseline. It is well recognised that medication overuse has a close association with headache as well as comorbid depression and anxiety.40 As previously reported, headache days were reduced in this subgroup.23 It is possible that the reduction in depression and anxiety symptoms that were observed was related to the beneficial effect of onabotulinumtoxinA, the possibility that as patients feel better their headaches improve and their depression and anxiety improve, or that patient medication strategies improve by removing overused medications, and consequently their headaches improve or they receive a preventive medication, which also leads to improvement in depression and anxiety symptoms. In this analysis, >40% of all patients experienced a clinically significant improvement in sleep patterns (ie, a change in PSQI global score of ≥3 points28); the results were similar in 99.4% of patients with poor sleep quality at baseline. Approximately one-third of all patients experienced a ≥30% reduction in FSS score. It has long been recognised that poor sleep quality and fatigue are associated with psychiatric disorders. Indeed, insomnia/hypersomnia and fatigue are two of the nine hallmark symptoms of depression.41 As with the symptoms of depression and anxiety, poor sleep quality also negatively influences headache severity,14 and when occurring with depressive symptoms in people with migraine may result in cognitive decline.42 Given the adverse consequences of comorbid psychiatric symptoms in individuals with migraine,43 the role of onabotulinumtoxinA on these symptoms warrants further investigation. Over nine treatment cycles, onabotulinumtoxinA was well tolerated, with mild and transient adverse events and no unexpected adverse events. There were few reports of suicidal ideation. The limitations associated with a non-randomised, open-label study with long-term follow-up have been previously outlined and include unintentional bias and low persistency rates.23 However, because the efficacy and safety of onabotulinumtoxinA in people with CM have been clearly established, an open-label design was considered appropriate for this extended-duration study (108 weeks) to enable the assessment of effectiveness in individuals motivated to stay on treatment for nine cycles. In our study over a period of 2 years, 11.5% of patients were lost to follow-up compared with 5.5% in the shorter 52-week PREEMPT studies.22 A further 12.8% of patients withdrew consent over the 2-year study duration. It was not expected that patients who did not benefit from onabotulinumtoxinA would stay on treatment. The results from the PREEMPT trials indicated approximately 50% of patients experienced a ≥50% reduction in headache day frequency after two treatment cycles and approximately 70% after five treatment cycles.22 In our study, 56.1% of patients remained on onabotulinumtoxinA treatment for nine treatment cycles, but not all of those attended the final follow-up visit, possibly due to a lack of motivation to attend a visit where no treatment was being administered. Further, an analysis of the 282 patients who completed all study visits demonstrated that onabotulinumtoxinA reduced headache days to a similar level seen in the overall population (week 108: –11.8 [7.3] vs –10.7 [6.4] days, respectively), suggesting limited bias from low persistency rates. In our study, we also permitted the concomitant use of a single oral preventive medication, with medication remaining stable until at least week 24. Preventive medications could potentially affect symptoms of depression and anxiety; however, as preventive medications were only added in 6.1% (n=44) of patients, it is unlikely that the addition of these medications had a clinically relevant effect on our results. The definitions of depression and anxiety were not based on a clinical diagnosis but on the self-reported validated PHQ-9 and GAD-7 questionnaire sum scoring methods, respectively, chosen for their widespread acceptance and simplicity to administer in a clinical trial situation. The sum score algorithm does not directly follow the clinical algorithm from the DSM-IV; the primary criteria necessary for a clinical diagnosis based on the DSM-IV criteria do not need to be endorsed in the sum score method for an individual to be classified as having clinically significant depression or anxiety. Similarly, the definitions of poor sleep quality and fatigue were based on PSQI and FSS self-assessments. The exclusion of patients with severe depression and suicidal ideation means the effect of onabotulinumtoxinA on patients with the most severe baseline depression symptoms was not captured. If those with the highest scores had been included, it is possible that outcomes may have varied. In this study, cut points of PHQ-9 ≥5 (for depression), GAD-7 ≥10 (for anxiety) and PSQI >5 (for sleep quality) were selected. Different cut points could have resulted in different outcomes. Furthermore, as previously discussed, our definition of clinically relevant change in depressive and anxiety symptoms differed slightly from others.31 32 Finally, the exploratory nature of the current analyses may limit the widespread generalisability of the results. Nonetheless, the study adds to our understanding of CM management in patients with comorbid depression, anxiety, fatigue and poor sleep quality. The change in depressive symptoms in patients with CM is particularly impressive, with >80% of the ≥25% headache day reduction responders experiencing clinically meaningful reduction in depressive symptoms. Further research should be undertaken to determine whether changes in headache frequency and severity after onabotulinumtoxinA treatment are driving improvements in the comorbidity or whether improvements in comorbid disease symptoms are an independent effect of onabotulinumtoxinA. Data from the COMPEL study support the efficacy and safety of onabotulinumtoxinA for the treatment of CM in people with symptoms of depression and anxiety for up to 108 weeks. Depression and anxiety symptoms were significantly reduced even in patients who did not have meaningful reduction in headache days after onabotulinumtoxinA. OnabotulinumtoxinA treatment was also associated with improvement in sleep quality and reduced fatigue symptoms across the analysis population. Together, these data suggest that onabotulinumtoxinA may have beneficial effects beyond those of headache frequency reduction, particularly in people with CM with psychiatric comorbidities. Editorial support for the development of this manuscript was provided by Lee B Hohaia, PharmD, of Complete Healthcare Communications (North Wales, Pennsylvania), a CHC Group company.
. The International Classification of Headache Disorders, 3rd edition. Cephalalgia 2018;38:1–211.
. Prevalence of migraine in the Canadian household population. Health Rep 2014;25:10–16.
. The relationships between migraine, depression, anxiety, stress, and sleep disturbances. Acta Neurol Belg 2015;115:6.
. Full prescribing Information. Irvine, CA: Allergan, 2016.
. Diagnostic and statistical manual of mental disorders. Washington DC, 1994.
. Diagnostic and statistical manual of mental disorders. 5th edn. Arlington VA, 2013.